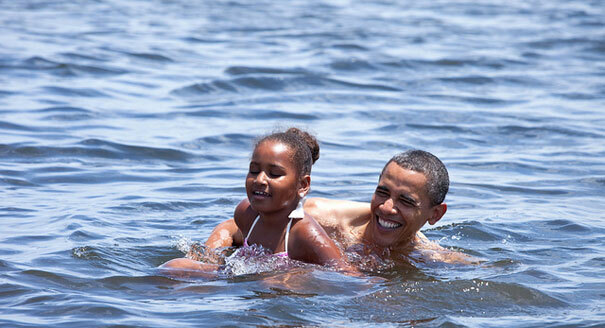 In the ongoing narrative of all is well in the Gulf of Mexico, Barack Obama and his family came to Panama City Beach Florida for vacation. They dined on Gulf seafood and the President announced to the press, “Beaches all along the Gulf Coast are clean, they are safe, and they are open for business,” and then he briefly went swimming in the protected inlet of St. Andrews Bay off the Gulf’s main waters, a place that was never affected by the spill and is part of a watershed quality plan that was given first response status for the past four months, rigorously controlled by strict water testing. This was all yesterday, and this is all over as after his restful 27 hour-long vacation, he and the rest of his family then left for Martha’s Vineyard where they will spend another 168 hours showing how the waters off the coast of Rhode Island are also safe for swimming. Gestures are fine and America, we love our symbols, but to maintain any sort of resonance, those gestures and symbols must also be meaningful. Tiring, is the way a meal is presented as proof that long-term consumption harbors no danger, or a how a five minute dip is meant to show the Gulf’s waters are safe for families to swim in for the remainder of the summer. Tiring, is how the presidential press doesn’t ask the right questions. Not to mention, these symbols show disrespect to the families who live on the coastlines that have been inundated with oil and are getting sick. For those that are ill, for those that are suffering on the Gulf Coast, for those that have lost their means of employment and have had their families and culture threatened by British Petroleum’s catastraphuk, hollow symbols serve only as one more punch of damage they are expected to take with a smile, before they say thank you for the honor of a 27 hour eye-blink of attention that while containing very little truth, promotes to the rest of the country how their mountain serves only as a mole-hill in some government official’s photo-opportunity. Plus 10 internets for the biafra/nomeansno reference.